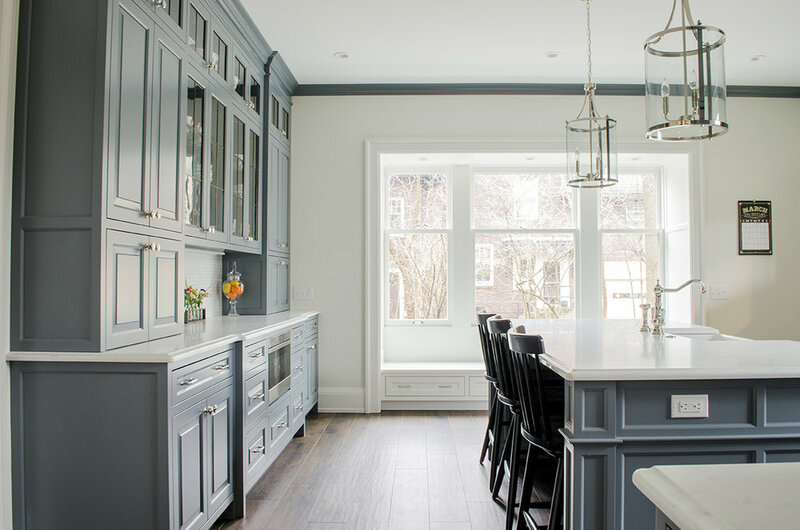 Explore the evolutionary process of aN outdated kitchen revived & reimagined into a vibrant central space for family, memories, and, of course, good food. 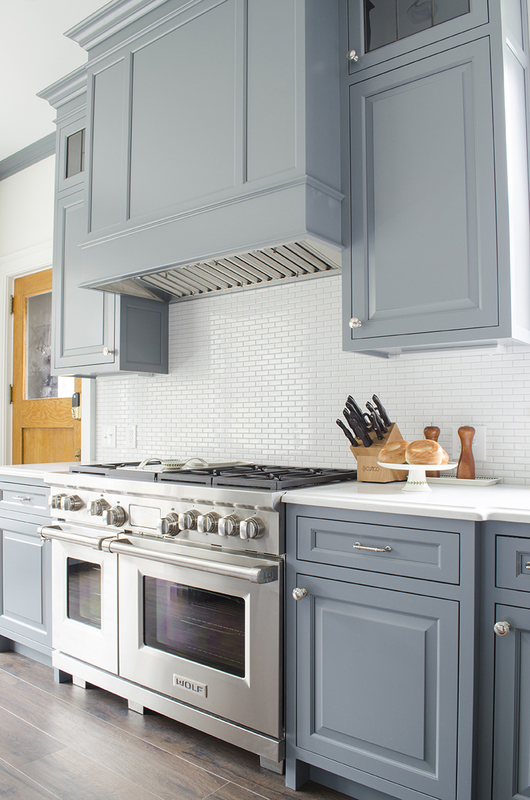 Built in the 1920's, this antiquated kitchen had been put through decades of wear, tear, touch-ups, and updates without ever quite reaching its full potential. The rooms lacked natural light and were separated with walls, creating a dark and closed-off atmosphere in the center of the house. Spaces that were used a century ago had now become outdated and inhibiting. This dining area was the other room attached to the pantry. There were multiple unnecessary walls and doors leading to and from this room and the main kitchen. The butler's pantry was a service kitchen used in the early 1900s which functioned as a transitional space between the kitchen and dining room. As convenient as this was in the "Downton Abbey" era, it was now nonessential space attached to the kitchen. 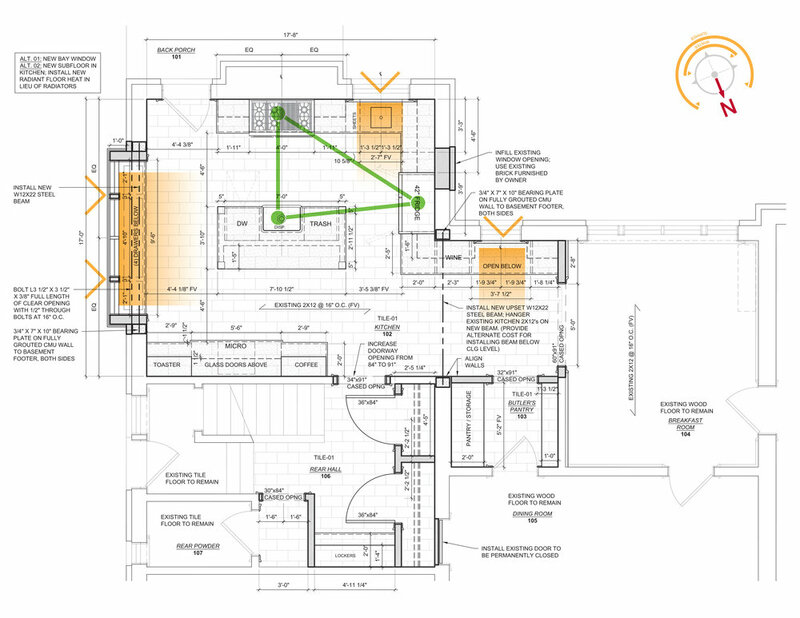 Instead of sectioning off each room with their own functions, the goal was to open up and connect the existing spaces while maintaining a natural flow and functional, multi-use kitchen workspace. The wall dividing the main kitchen and the butler's pantry would be removed, allowing the daylight from the existing window to be part of the new kitchen space. This also would directly connect the breakfast room to the kitchen, removing multiple points of entry. A large bay window would be installed, improving the overall light to the space while making the space feel much larger. 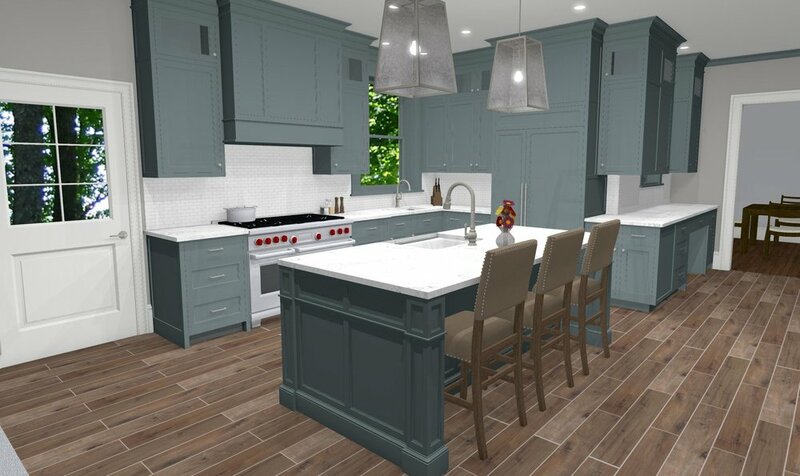 The entire space would be gutted to make way for the completely new kitchen concept. There are many options for making a kitchen functional and well laid out. The work triangle is shown as the space is laid out for maximum work efficiency with the most convenient appliances clustered together. Creating a 3D environment helped quickly guide them towards a clearer direction. One of the main challenges in any major renovation is addressing how the client continues to live in the house during the transformation. At JP Compass we pride ourselves on our ability to accommodate the client while still executing the build in a timely manner and this project was no exception. 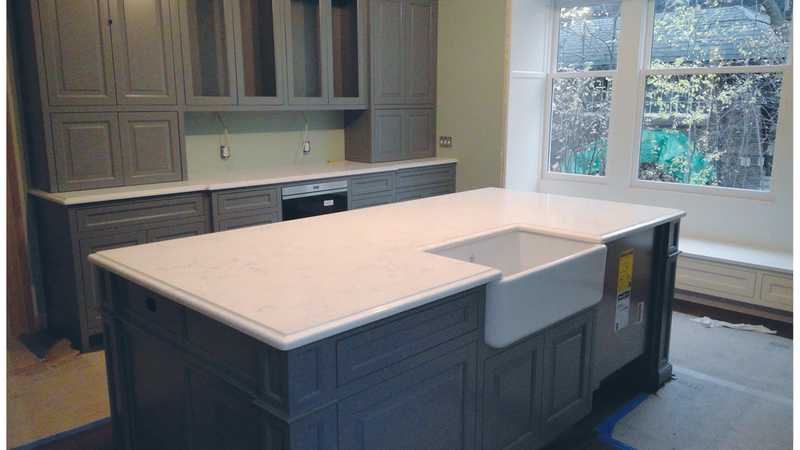 The client needed access to their remodeled master suite as soon as possible during the construction process. 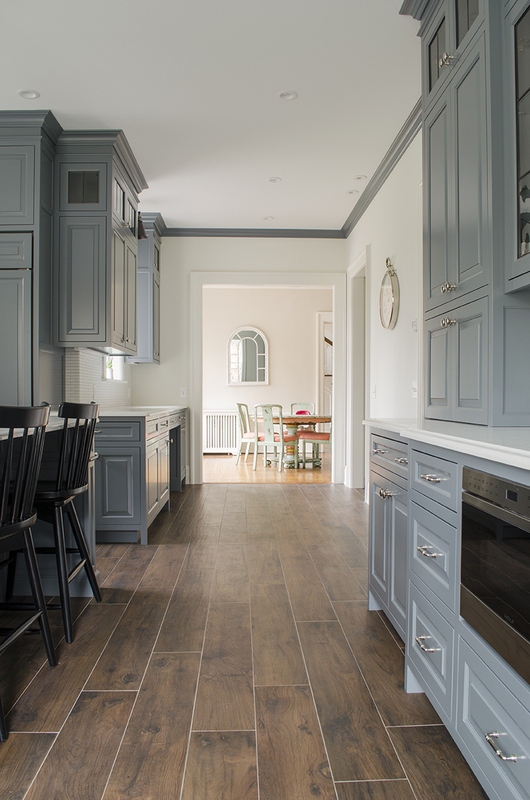 With this in mind, JP Compass developed a schedule that staggered the build in order to focus on the master suite first and get the client back into that space quickly while the kitchen was completed. The kitchen was then sealed from the rest of the home to create a distinct construction zone that did not affect the rest of the living area, including the new master suite. And out of the old, came the new. We were able to find a solution to each problem at hand and transform the space to its greatest potential. A larger bay window was created allowing seating, storage, and a stream of new light to flow into the kitchen. 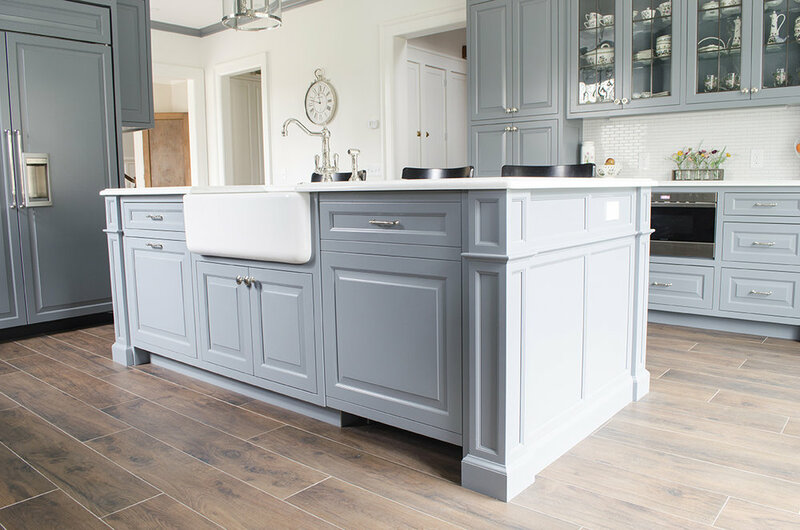 There is now island seating, a large hutch-type cabinet for storage, a serving counter (with its own sink), and an informal “office” area. The space is brighter, more practical, and feels twice as large.